Reference number for this case: 29-Oct-54-Mesples. Thank you for including this reference number in any correspondence with me regarding this case. "There was a lot of excitement yesterday morning in the supplement class of Huriel, where the noisy students, for the most part, had formed an attentive circle around one of their comrades. 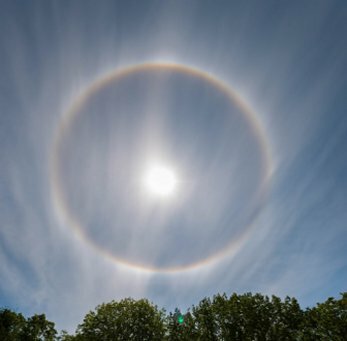 Jean-Pierre Coubret, 14, residing at Saint-Palais, told them his bewildering encounter with a 'flying saucer': a mysterious disc, haloed in red, pursued him for a few seconds while he was on his way to school, two people from Mesples also observed the phenomenon, but dare not formulate any hypothesis." The newspaper reported that Jean-Pierre Coubret, a fifth-grade student in Huriel's supplement class, returns twice a week to his parents' home in Saint-Palais on Wednesday and Saturday nights. On the morning of October 29, 1954, he was returning to school on his moped as usual. Around 8 o'clock in the morning, after crossing the village of Mesples, at the top of the hill, he suddenly saw a large disk facing the sun. He did not pay much attention, continued to drive while observing the phenomenon "with the corner of the eye." Suddenly, the disk moved, it made a sudden jump that brought it closer to the ground. Intrigued, the child stopped. The disc was spinning fast on itself as it moved in the sky. It did not stand in a horizontal position, but moved vertically on its edge. 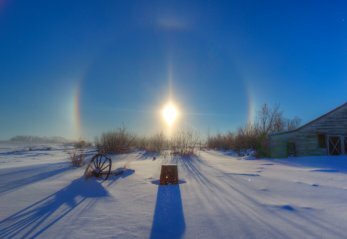 The object was in the form of a large silver-colored disk that captured the sun's reflections, and around it there was a halo, sometimes pink, sometimes purple, leaving an impressive trail of light as it moved. The boy was looking with curiosity at the disc, but suddenly the disc rushed toward him at full speed. Terrified, the child straddled his moped and hurriedly turned around. Fear made him lose control of his moped and he stalled the engine twice. He accelerated as much as he could, throwing terrified glances behind him. "I had the distinct impression that for a few seconds the saucer chased me." Stumbling and livid, he rushed into the first house he encountered, the home of Mr. and Mrs. Gentil, farmers in Mesples, saying: "Come to see this, I'm afraid, a saucer is chasing me." Mrs. Gentil went out of her house. She told the newspaper, "At first I was dazzled by the sun and I did not see anything, but by staring well, when the eyes were used to the light, I also saw a disc: It was at least three times larger than the sun and surrounded by red and purple hues, it moved quite fast, and it passed several times in front of the sun: it looked like it was spinning fast on itself, but I cannot tell if it was a 'saucer' because I do not know how they look." The object then "disappeared" without any noise. Mr. and Mrs. Gentil could not explain the phenomenon. They did not want to "embark" on a case "which seemed to them very mysterious", as Mrs. Gentil told the gendarmes of Huriel who came on the scene. She as well as young Jean-Pierre are certain of what they saw. The information given by his teachers to the newspaper "is far from presenting him as an unbalanced child: he works well in class." The newspaper presents him as intelligent, intimidated by their questions, and considers that "it is not a joke invented from scratch by a mischievous kid." He could also not have faked his fright, "Mrs. Gentil is very clear on this point." The news naturally spread like wildfire and Jean-Pierre Coubret had become a star in the eyes of his classmates. At least three other newspapers gave slightly shorter versions of the case; which in the 1960's entered, reduced to a few lines, in the UFO literature. In the 1970's, ufologist Jean Giraud noted that currently the witness refuses to talk about his adventure. The article underneath has been published in the daily regional newspaper La Montagne, of Clermont-Ferrand, France, on page 5 on October 30-31, 1954. Montlucon - a big commotion reigned yesterday morning at the Huriel complementary course. The pupils, usually noisy, for the majority, had formed an attentive circle around one their comrades. Jean-Pierre Coubret, 14 years old, resident of Saint-Palais, told them his amazing encounter with a "flying saucer:" a mysterious disc, haloed of red, chased him for a few seconds, whereas he was going to the school. Two inhabitants of Mesples also observed the phenomenon, but do not dare to formulate any hypothesis. Jean-Pierre Coubret, pupil of the fifth grade at the Huriel complementary course, returns twice per week to Saint-Palais at his parents: on Wednesday and Saturday evenings. Yesterday morning, he returned to the school by motorcycle as usual. Around 8 o'clock, after having crossed the borough of Mesples, at the top of the hill, he suddenly sees a large red disc vis-a-vis the sun. He hardly pays attention to it and continuous to ride while however observing the phenomenon at the corner of the eye. Suddenly, the disc moves, it makes an abrupt jump which brings it closer to the ground. Puzzled, the child stops. The "flying saucer" rotates quickly while moving in the sky. Remarkable characteristic: that was not like the others in a horizontal position, but it evolved with its side vertically oriented. It appeared as a large disc of silver plated color which collected the reflections of the sun. Around the machine a sometimes pink halo, sometimes turning into purple, leaves an impressive luminous trail when the disc moves. "The saucer rushes towards me"
The child looks at the disk with curiosity, still far away: but suddenly, the machine dives onto him at full speed. Frantic with fright, the young schoolboy goes onto his motor-cycle and takes an immediate U turn. The fear makes him lose the control of his machine and the engine stalls twice. He accelerates as much as he can, throwing terrorized glances behind him. "I had the clear impression, he told us, that during a few seconds, the saucer was chasing me." Stumbling and pale, he rushes into the first house which he saw, in the residence of Mr. and Mrs. Gentil, farmers in Mesples. "Come see quickly, I am afraid, a saucer is pursuing me!" Mrs. Gentil goes out of the house: "Initially I was dazzled by the sun and I did not see anything, she told us, but when I focused well, when the eyes were accustomed to the light, I also saw a disc: it was at least three times larger than the sun and surrounded by red and purple reflections. It moved rather quickly, and it made several passes in front of the sun: one would have said that it rotated quickly, but I then again I cannot say if it was a "saucer" for I do not know how saucers look like." And suddenly the mysterious machine disappeared without any noise. Nothing remains in the sky except for the sun continuing to bathe the fields with its already warm rays. Mr. and Mrs. Gentil refuse to give explanations to this phenomenon. With excellent common sense, they do not want "to ride" on a case which appears quite mysterious to them. Mrs. Gentil specifies this well with the gendarmes of Huriel who came on the location. But it nevertheless remains certain that she saw this three time bigger than the sun disk. As for the young Jean-Pierre, he is positive; and the information which his teachers give us is far from presenting him as an unbalanced child: he works well in in the courses. Besides, it is enought to look at his open and intelligent face to exclude the idea of an hallucination. Moreover our questions intimidate him, which well proves that this is not a completely made up joke by a mischievous kid. Besides he could not had faked such an intense fright yesterday morning. Mrs. Gentil is formal about this. The news naturally spread like a running dog. Jean-Pierre Coubret became a star in the eyes of his comrades of the complementary course. Many people remain skeptics regarding this apparition of a new "flying saucer" in the sky of the Montluçon area. This is so with all those who do not see these strange machines to disbelieve what the others tell. "Come quickly see, I'm afraid, a saucer is chasing me." Mrs. Gentil went outside on her doorstepand did not see anything at all initially. However, scanning the sky, she saw in her turn a disc "three times as large as the sun, tinted of red and purple. The machine rotated quickly, then it disappeared suddenly". Young Jean-Pierre Coudret, resident of Saint-Palais (the Allier), was going by motorbike to the complementary course at Huriel when, according to his claims, around 8 hours, he saw, at the exit of the borough of Mesples, a large disc facing the sun which suddenly started moving, approaching the grond at high speed. The kid, puzzled, stopped to observe the phenomenon. The "saucer" - a weird fact - stood vertically and not in an horizontal position. It appeared as a large disc of silver color, sometimes haloed red, sometimes haloed purple and leaving in its wake a luminous trail. The young schoolboy, more and more concerned, had the clear impression then that the machine dove towards him. Terrified, he climbed his motorbike and made half-turn, going towards Mesples, where he entered in the first farm. An object of round form emitting a sharp reddish-orange gleam crossed at a very high speed the sky of our city. This phenomenon was seen by many inhabitants of the various districts of the city. a saucer is chasing me"
Jimmy Guieu reports that on October 29, 1954, Jean-Pierre Coubret, a 14 year old young person of Saint-Palais in the Allier, was riding his motorcycle to go attend the Huriel complementary course towards 8 o'clock, when he saw a large disc vis-a-vis the sun at the exit of the borough of Mesple. The disc suddenly started to move and approached the ground at high speed. Jean Pierre Coubret was intrigued and stopped to observe the phenomenon. Jimmy Guieu reports that the flying saucer stood vertically and not horizontally, and appeared as a large disc of silver plated color sometimes haloed in red and sometimes haloed in purple, and leaving a luminous trail in its wake. "Come see it! I'm afaraid, a saucer is after me." A farmer, Mrs. Gentil, run to him and was also struck to see an enormous tinted luminous disc of red and purple, turning in the sky, which turned more and more quickly, and abruptly disappeared, it in what Jimmy Guieu sees a proof of the possibility for the saucers of making itself invisible. Oct. 29, 1954, 07:45, Mesples (France). #169. October 29. In Mesples, close to Montlucon, a disc standing on the section and whirling very quickly descended quickly towards the ground. There were two witnesses to see it disappearing suddenly in the sky. It was 7:50 in the morning. A fourteen-year-old boy sought refuge crying on the farm owned by Mrs. Gentil, saying that he was being chased by a saucer. A red and purple disk, three times as wide as the sun, spinning at high speed, was seen approaching rapidly to the ground, and then disappeared. Local police investigation (Personnel). The young Coubret 14-years-old who was going to the C.E.G. of Huriel was pursued by a rotating disc (?) 1 m in diameter standing vertically on the edge. Observation often reported. A landing could have taken place. (Centre Martin for 10/30/1954 and personal documents). October 29 (La Montagne for 10-30) Mesples 8:00. P. Coubret, aged 14, from Saint-Palais, on his way to the School of Huriel by motorcycle, had just crossed Mesples, when he suddenly saw a large disc moving on the edge, turning rapidly on itself while moving in the sky. The disc seemed to be rushing at him; the boy, frightened, turns around and takes refuge at the first home he finds, at Mr. and Mrs. Gentil's, in Mesples. The latter come out and see the disc, three times as big as the sun, surrounded by red and purple hues. It was moving quickly, passing several times in front of the sun, seeming to rotate quickly on itself. The witness who was going to school was "chased" by a lum. green disc. He took refuge in a neighboring farm. Many sources but currently the witness refuses to talk about his adventure. The two authors indicate that in Mesples in the department of Allier around 8 o'clock in the morning of October 29, 1954, after having crossed the borough of Mesples, at the top of a hill, a teenager suddenly saw a large disc of silver plated color collecting the reflections of the sun. Around the machine, an aureole sometimes rosy sometimes turning purple leaves an impressive luminous trail when it moves. It is vis-a-vis the sun; he hardly pays attention and continues his travel, observing it from time to time. Suddenly, this disc moves and makes a jump which brings it closer to the ground. Intrigued, the schoolboy stops. The discoïdal apparatus rotates quickly while moving in the sky. The machine moves in a vertical position, on the section. Suddenly, it gos towards the witness at great pace. Siezed by an intense fright, the young schoolboy stalls his engine twice and accelerates as much as he can, throwing behind himself terrorized glances. Stumbling and livid, he rushes in the residence of a couple of farmers in Mesples. "Come see quickly, I am afraid, a saucer follows me!" They accompany the child, and they observe the object which evolves above the hedges and the brooms, passing several times in front of the sun. Suddenly, the mysterious machine disappears without noise. The authors indicate as sources Vallée, Quincy, and the newspapers La Montagne for October 30, 1954 and L'Echo Républicain for November 1, 1954. M. Gentil was in her farmhouse the morning of October 29th when he heard a frantic knocking at her front door. She opened the door and found a weeping teenage girl who was seeking safety because she was being "chased by a saucer." Outside in the sky a whirling, red and purple colored disc could be seen. The thing soon dropped to a lower altitude and disappeared. The local police took an interest in the incident. 232. Rogerson, Peter. "The Catalogue" MUFOB New Series 4. Autumn 1976. #38. p.7. MESPLES NW/MONTLUCON,FR:SCR ON EDGE CHASES GIRL:DROPS:VANISHES IN THIN AIR! Luc Chastan indicates that in the Allier in Mesples on October 29, 1954 at 08:00 hours "Towards 8 o'clock, after having crossed the borough of Mesples, at the top of a hill, the witness, a teenager, suddenly sees a large disc of silver color picking up the reflections of the sun: around the craft, an aureole sometimes rosy sometimes purplished leaves impressive luminous trails when it moves. It[/he] is oposite the sun; he hardly pays attention and continues his trip to it while observing it with the corner of the eye. Suddenly, this disc moves and makes a jump which brings it closer to the ground. Puzzled, the schoolboy stops. The discoid apparatus rotates quickly while moving in the sky. The machine moves in a vertical position, on the section. Suddenly, it moves towards the witness at great pace. Taken of an intense fright, the young schoolboy stalls the engine twice and accelerates as much as he can, throwing back terrorized glances." "Stumbling and pale, he rushes into the home of a couple of farmers in Mesples. "Quick, come to look, I am afraid, a saucer is chasing me!" They accompany the child, they observe the object which moves above the hedges and the brooms, it passes several times in front of the sun." "Suddenly, the mysterious machine disappears without noise." The website indicates that on 29 October 1954 at 07:45 in Mesples, France, "A disk three times as large as the sun, red and purple, spinning rapidly". And: "At 7:45 a.m. in Mesples, France a 14-year-old boy sought asylum in the farmhouse owned by Mrs. Gentil, screaming that he was being chased by a flying saucer. A disc three times the apparent diameter of the sun, red and purple in color, and spinning rapidly, was seen descending swiftly toward the ground. It then vanished. There was an investigation of the incident by the local police." And: "A 14-year-old child sought asylum in the farmhouse owned by Mrs. Gentil, crying that he had been chased by a saucer. A disk three times as large as the sun, red and purple, spinning rapidly, was seen descending swiftly toward the ground and then it vanished. Investigation by local police." And: "One red saucer was observed by two female witnesses, typical age 14, on a farm for five minutes." The sources are noted as Guieu, Jimmy, Flying Saucers Come from Another World, Citadel, New York, 1956; Bowen, Charles, The Humanoids: FSR Special Edition No. 1, FSR, London, 1966; Vallee, Jacques, Computerized Catalog (N = 3073); Vallee, Jacques, Challenge to Science: The UFO Enigma, Henry Regnery, Chicago, 1966; Vallee, Jacques, Preliminary Catalog (N = 500), (in JVallee01); Vallee, Jacques, A Century of Landings (N = 923), (in JVallee04), Chicago, 1969; Schoenherr, Luis, Computerized Catalog (N = 3173); Hatch, Larry, *U* computer database, Author, Redwood City, 2002. The website indicates that on 1 November 1954 in the morning in Mesples, France, there was a sighting. The source is said to be: "Newspaper Clippings". The website indicates that on 2 November 1954 at 08:00 in Mesples, France, "An unidentified object was sighted, but with appearance and behavior that most likely would have a conventional explanation. One object was observed by two witnesses." The source is noted as: Vallee, Jacques, Computerized Catalog (N = 3073). In Saint-Palais (the Aliier), a schoolboy tells that a flying saucer chased him. 1954 - At 7:45 a.m. in Mesples, France a 14-year-old boy sought asylum in the farmhouse owned by Mrs. Gentil, screaming that he was being chased by a flying saucer. A disc three times the apparent diameter of the sun, red and purple in color, and spinning rapidly, was seen descending swiftly toward the ground. It then vanished. There was an investigation of the incident by the local police. (Sources: Jacques Vallee, Passport to Magonia: A Century of Landings, p. 240, case 321; Jimmy Guieu, Flying Saucers Come from Another World, p. 232). *Oct. 29, 1954 - At 7:45 a.m. in Mesples, France a 14-year-old boy sought asylum in the farmhouse owned by Mrs. Gentil, screaming that he was being chased by a flying saucer. A disc three times the apparent diameter of the sun, red and purple in color, and spinning rapidly, was seen descending swiftly toward the ground. It then vanished. There was an investigation of the incident by the local police. (Sources: Jacques Vallee, Passport to Magonia: A Century of Landings, p. 240, case 321; Jimmy Guieu, Flying Saucers Come from Another World, p. 232). Jean-Pierre Coubrait [sic] was driving to school on his moped when he saw a large disc facing the sun. As he drove on, it came down close to him, assuming a vertical position, and seemed to chase him. In panic he stopped at the farm of Mr and Mrs Gentile [sic]. Mrs Gentile went out to investigate, at first she saw nothing, then saw a disc, 3-4 times the angular diameter of the sun, surrounded by red and purple reflections. The object rotated several times then disappeared. The thing had left a trail and the boy had the impression that the thing had "stung" him. There were police enquiries. Jacques Bonabot citing CFRU Ouranus [sic]8 citing Centre Matin 30 October 1954. Note: "Gross 1954" is supposed to indicate my page, but no link is provided and its content is not really reflected. This summer, we offer several stories from our special issue L'Auvergne Etrange, devoted to the most mysterious affairs of the region. Unknown creatures, haunted houses, witchcraft... Today, an anollok at the extraterrestrials. We are in 1954. Abbot Pierre launches his call during the cold wave hitting the country. In May, France capitulates in Indochina. In June, Mendes France is elected President of the Council. In November, the Algerian war begins. But from September on, a much lighter (but spectacular) news is installed in the columns of the newspapers, with a metronome regularity. For example, October 2, around 10 a.m., in Clermont-Ferrand. At the modern college, during recess, girls stop playing. Something is irresistibly attracting their attention. At the same moment, Rue Diomede, Madame S. looks up in her turn. A strange light shines in the sky. She thinks first of all to discern an advertising balloon. But by paying attention, the object is very different: it is a metal mass, almost motionless, animated by a slight oscillatory movement. Suddenly, the craft picks up speed and disappears from her field of vision. In neighboring houses, other neighbors report a similar scene. Eighth episode of the saga of autumn. Another UFO. The year 1954 remains the period when we recorded the most reports in France. 2.000 cases were reported by the press. Between September and November, the apparitions multiply, from the most disturbing to the most far-fetched. Bright craft are seen by several people at the same time, from Moulins to Puy-en-Velay. And mysterious facts do not just happen in the sky. On the 12th of October, in Montluçon, a railwayman discovered on the railway a person covered with hair who spoke an incomprehensible language. Panicked, the railwayman flees as a luminous machine takes off behind him. In Saint-Palais (Allier), a schoolboy says that a flying saucer has pursued him. In Le Donjon (Allier), hunters reportedly fired at a craft and recovered metal debris. The panic is such that it reaches the Assemblée Nationale. Three Gaullist MPs ask the Minister of Air for insights into these intrusions. One of them demands that the craft be chased by the army. The press is in flames. But as the days go by, cases gets deflated. Here it was not a saucer but a meteorite. There, an airship. Elsewhere, a balloon. Not to mention the hoaxes. Thus, the hairy creature of Montluçon was only a colleague of work of the witness, disguised with goatskin. And his flying machine was a fireworks rocket. As for the hunters who shot down a craft, they end up confessing their lie. Suddenly, the press gets tired. The stories are becoming scarce. In November, the Parisian doctor Heuyer sealed the end of the wave in front of the Academy of Medicine by putting a name on the phenomenon: "collective psychosis". However! UFO specialists do not lay down their weapons. Those who believe it say it: out of 2,000 cases, there must be a sign from elsewhere! The thirty most mysterious stories that have occurred in our region are to be discovered in our special issue L'Auvergne Etrange, to order online on our shop. As the journalist(s) of La Montagne said the gendarmes of Huriel came, there must be an official report on this case; however, only few gendarmes reports of the time are published sor far, and it seems that the official policy is not to publish the official report when the witness name was known. There is a little uncertainty about the name of the boy: Coudret or Coubret, and perhaps even Courbet. Coudret is an existing but rare name; Coubret is an existing name even rarer, and Courbet is not very common. One trivial and usual explanation would be a meteor, but it hardly fits: nobody else reported the least meteor that day around 8 a.m.; and a meteor would not "stand on the edge." Peter Rogerson [pr2] suggests in 2016 that it was a "Mock Sun", i.e. 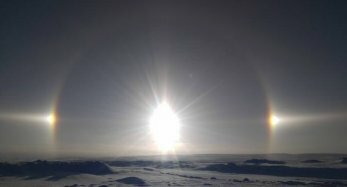 a "Sun dog", formally named a parhelion in meteorology, this is an atmospheric optical phenomenon that consists of subtly colored patches of light on both sides of the Sun within a 22° halo, caused by refraction of sunlight by ice crystals in the atmosphere. sometimes there is also a vetical "pillar" from the Sun and an horizontal bar from the Sun to its two lateral refaction spots, the whole appearing like a cross in a circle with the sun at the center and the two refactions on the circl at the left and right of the Sun. 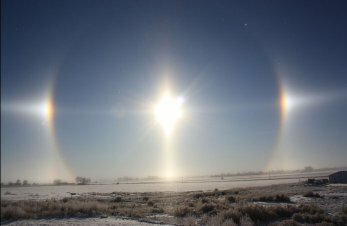 Sun dogs are generally occurring when the Sun is near the horizon, as its light then crosses more ice crystals. The phenomenon is totally motionless, it does not "dive" on the observer at any moment ("Suddenly, the disk moved, it made a sudden jump that brought it closer to the ground", "leaving an impressive trail of light as it moved." "The boy was looking with curiosity at the disc, but suddenly the disc rushed toward him at full speed." "it moved quite fast"). The phenomenon is of constant size - the circle is about 22° and remains of this same size constantly ("suddenly the disc rushed toward him at full speed"). 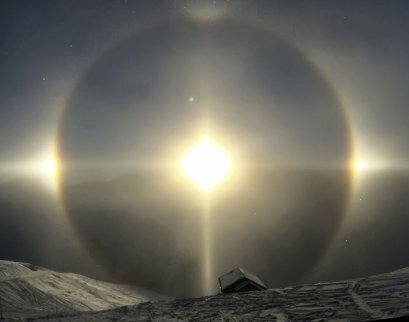 The lateral refractions of the Sun in a parhelia never pass in front of the Sun ("it moved quite fast, and it passed several times in front of the sun"). Of course, the newspaper may have misrepresented what both the boy and Mrs Gentil told; but this is in no way proven. One might think by some aspects of the story that the sighting lasted only a few seconds, but that is obviously only the duration of one of the phases of the observation: after noticing the disc, the boy continues to drives; when the disc seemed to rush at him he had stepped down from the moped as he climbed on it again, he had time to make a U-turn, the time to stall the engine twice, so to restart it twice, to get off, to alert people inside a house, to wait for them to go out, and at least Mrs. Gentil had time to go out, to accustom her eyes to the light of the sun and to see the disk. This could not be done in just a few seconds. So I do not see any trivial explanation that totally fits, and I do not see why this could not have been an observation of an extraterrestrial craft. I cannot decide with any certainty. [lm1] Article in the regional newspaper La Montagne, Clermont-Ferrand, France, page 5 in the October 30-31 edition, 1954. [le1] Article in the regional newspaper Le Méridional, France, page 1, October 31, 1954. [lp1] Article in the regional newspaper Le Provençal, France, page 9, October 31, 1954. [---] Article in the regional newspaper L'Echo Republicain, France, November 1, 1954. [jg1] "Black-Out sur les Soucoupes Volantes", book by Jimmy Guieu, Fleuve Noir publisher, France, pp 231-232, 1956. [jg1] "Flying Saucers Come from Another World", book by Jimmy Guieu, English version of "Black-Out sur les Soucoupes Volantes", page 232, 1956. [jv2] Jacques Vallée in "The Humanoids: A Survey of World-Wide Reports of Landings of Unconventional Aerial Objects and their Alleged Occupants", book by Charles Bowen, Neville Spearman publishers, U-K., 1969. [jv3] "Chronique des Apparitions Extra-Terrestres", French translation of "Passport to Magonia", book by Jacques Vallée, J'Ai Lu publisher, France, page 291, 1972. [ou1] "Dossier 'Allier'", in the ufology magazine Ouranos, France, Nouvelle Série #8, page 8, 3rd quarter 1973. [jv2] Jacques Vallée in "En Quête des Humanoïdes", book by Charles Bowen, French translation of "The Humanoids", J'ai Lu publisher, France, page 64, 1974. [pr1] "INTCAT Part 10", catalogue compiled by Peter Rogerson, in the ufology magazine MUFOB, U-K., New Series #5, page 7, Winter 1976 - 1977. [lg1] "The Fifth Horseman of the Apocalypse - UFOs: A History - 1954 October", monography by Loren E. Gross, USA, page 95, 1991. 1.2 Patrick Gross October 22, 2011 Addition [lm2]. 1.3 Patrick Gross October 30, 2011 Addition [jv2], [dj1]. A search on the web and in my documentation did not reveal other sources. 1.4 Patrick Gross October 19, 2014 Addition [ni1]. 1.5 Patrick Gross November 30, 2016 Addition [ub1]. 1.6 Patrick Gross December 13, 2016 Addition [lg1]. 1.7 Patrick Gross December 7, 2016 Additions [lh1], [pr2], Summary. Explanations changed, were "Not looked for yet." 1.8 Patrick Gross December 16, 2016 Addition [pr1]. 1.9 Patrick Gross April 20, 2019 Addition [ev1].